Cupid, the God of desire, admiration and attraction is known to leave you with feelings of love after he strikes you with his bow and arrow. At SuperJeweler, we may not be Cupid, but your Valentine will truly desire our masterfully crafted pieces of jewelry at attractive prices that won't break the bank. There's no better way to express your love than with our stunning Valentine's Day gift collection. With so many sensational options to choose from, including diamond tennis bracelet styles, diamond stud earrings, diamond necklace styles, solitaire diamond ring options, diamond eternity band styles, birthstone jewelry and pearl jewelry, we guarantee your loved one will adore whichever Valentine's Day gifts you choose. Depending on her style, there are an array of options to express your love with our Valentine's Day gifts. Whether you're in a budding relationship or you have been with your loved one for years, we have plenty of options to steal her heart. Looking for a gift for your new love is simple with our birthstone jewelry. Spoil her with a remarkable birthstone jewelry set, showing her how much you care. If you're looking to make her heart skip a beat, captivate her heart with our shimmering stars collection or give her your heart with our diamond heart necklace styles. 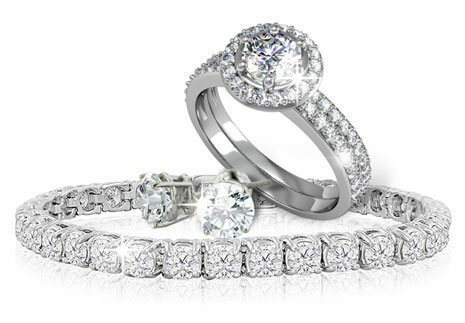 For those looking to express the depths of their never-ending love, choose from our extensive array of diamond eternity band styles, designed to last a lifetime, just like the love you have for her. Nothing portrays pure romance more than a finely crafted piece of jewelry. This Valentine's Day, surprise her with SuperJeweler's stunning Valentine's Day gifts, masterfully crafted to enchant her heart and awaken her soul. Because flowers and chocolate don't fully express how much you care, say it with diamonds.